BIA The Clarkson Controversy, Sunday Shopping, Freedom of Choice, Competition, Private Property Rights, Freedom of Religion, Justice, Self-Responsibility, Free Enterprise, The Freedom Party campaigns; (Openers) The Long Hard Climb, party success challenges; 1988 Wellend-Thorold election results, various newspaper excerpts (Guardian Express); Calendar of Individual Freedom Expands Freedom’s Horizons, forecasts and strategies; Province is staying out of Clarkson BIA affairs (Mississauga News); Clarkson Controversy, What is BIA?, Battle Rages over Clarkson’s BIA, Clarkson Business Group in Turmoil, Clarkson BIA meeting turned to chaos (Mississauga News), Letter from Adams Rent-All to John Eakins, Minister of Municipal Affairs; Dresden Opposes Sunday Shopping (Chatham Daily News) Not Just a Single Issue – Anatomy of the Sunday Shopping Debate, FP Stance on Sunday Shopping Ad, It’s a Matter of Choice – FP rep Fitzgerald appears before Standing Committee on Administration of Justice – St. Catharines, 1906 Lords Day Alliance and Act (Welland Evening Tribune); Open-Line on Sunday Laws; Jailed For Justice, Marc Emery first to be jailed for violation of Retail Business Holidays Act; Also-rans Driven by Idealism, Pay Equity Rules – Market Forces, Marketplace Offers Better Education System (London Free Press); FP represented on CFPL-TV London – Sunday Shopping; Consent (issue #6); Freedom Forum – letters, questions, opinions. Version: Two of at least two. NOTE: Freedom Flyer at this time was produced on a Canon photocopier that was capable of applying several colours (one colour per pass through the machine). 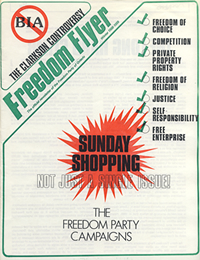 During the run of printing for this large issue of Freedom Flyer, Freedom Party ran out of some colours, substituting others for other copies of the issue. Two versions of Issue #13 have been found and both are included in this online archive. They are referred to, arbitrarily, as “v.1” and “v.2”, but there was no difference in the content among copies of Issue #13…just colours.